The Actors’ Renaissance Season begins performances on January 19. 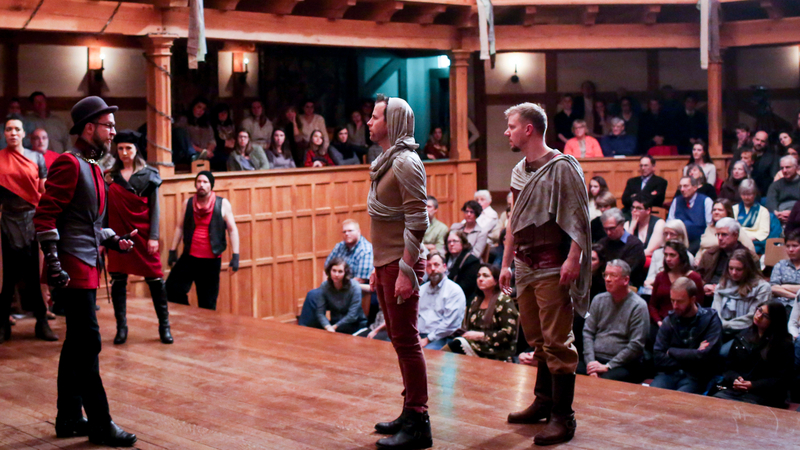 STAUNTON, VA – January 9, 2017 – The American Shakespeare Center (ASC) begins its annual Actors’ Renaissance Season with performances of Hamlet and Richard II on January 19. The Actors’ Renaissance Season is the ASC’s experiment into what Elizabethan and Jacobean rehearsal conditions might have been and features a troupe of veteran ASC actors who design the productions and conduct rehearsals without a formal director. Performances begin with Hamlet on January 19. Hamlet (Josh Innerst) struggles to discern reality from illusion in the rotten state of Denmark as he copes with the loss of his father, his mother’s remarriage, and life’s biggest questions. For centuries, audiences have seen themselves in the remarkable, troubled prince at the center of this ghost story, comedy, seven-murder revenge thriller, and philosopher’s gold mine. Pay-what-you-will performances are on January 19 and 20. Free pre-show lectures are on January 25 and March 15. Richard II, Shakespeare’s magnificent exploration of the lives and deaths of England’s kings, begins January 20. Pitting Richard II, a man of words, against Bullingbrook, a man of action, Shakespeare raises the art of language to new heights, while reminding us that rulers “feel want, taste grief, and need friends.” ASC veteran Sarah Fallon wears the crown in one of Shakespeare’s crowning linguistic achievements. Pay-what-you-will performances are on January 20 and 21. Free pre-show lectures are on February 1 and March 8. Hamlet gets turned inside out with performances of Tom Stoppard’s Rosencrantz and Guildenstern are Dead beginning February 8. From the Oscar winner who gave us Shakespeare in Love, this wickedly funny companion piece to Hamlet shows the Dane’s story from the point of view of his school chums Rosencrantz (Chris Johnston) and Guildenstern (John Harrell). Tom Stoppard serves up a feast of wordplay, wit, and slapstick while exploring questions about identity and illusion. An instant classic, Rosencrantz and Guildenstern are Dead won the 1968 Tony Award for Best Play, appeared on stages all over the world, and became a major motion picture. Pay-what-you-will performances are on February 8 and 9. Free pre-show lectures are on February 15 and March 22. Brimming with sharp and elegant wit, William Congreve’s The Way of the World joins the repertory on March 1. Largely considered to be the greatest of the Restoration comedies, The Way of the World pits a pair of lovers against a host of manipulative characters, including the underhanded (and unhappily-aging) Lady Wishfort (Jessika Williams) and the villainous Fainall (Chris Johnston). It takes a healthy does of scheming and blackmail to give Mirabell (Tim Sailer) and Millamant (Allie Babich) a happy ending. Rife with satire, this scathing comedy uncovers the over-the-top inner workings of the idle upper class. Pay-what-you-will performances are on March 1 and 2. Free pre-show lectures are on March 14 and 29. John Marston’s Antonio’s Revenge begins performances on March 21. Antonio’s Revenge proves that happily-ever-afters don’t always remain so. Breaking from his supposed reformation, the evil Duke Piero (John Harrell) resolves again to destroy the relationship of his daughter Mellida (Allie Babich) and her future husband Antonio (Benjamin Reed) – by any means necessary. Writing around the same time as Hamlet, Marston echoes (or foreshadows) Shakespeare’s great work with themes of familial betrayal, hauntings, and existential questions that rock us to the core. Pay-what-you-will performances are on March 21 and March 23. Free pre-show lectures are on March 21 and April 5. The Actors’ Renaissance Season features ASC veterans Allie Babich, Lauren Ballard, Sarah Fallon, John Harrell, Josh Innerst, Chris Johnston, David Anthony Lewis, Shuté Lofton, Benjamin Reed, Tim Sailer, Christopher Seiler, and Jessika Williams. Actor talkbacks are held after each Thursday night performance. Residents of Staunton, Waynesboro, Augusta County, Harrisonburg, or Rockingham County can take advantage of $18 local rush tickets on Wednesdays, and Thursdays. College student rush tickets are available for all performances, 60 minutes before showtime with valid student ID. Student, Senior, Military, and AAA discounts are available. Groups of 15 or more who order together save 20%.